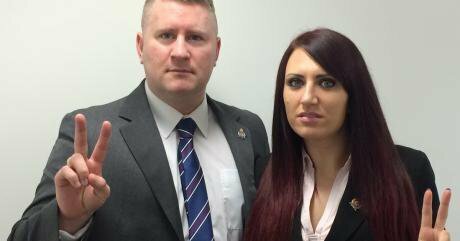 Britain First's leader and deputy, Paul Golding and Jayda Fransen, fair use. It is too early to know all the details, but a picture is emerging in the horrible murder of Labour MP for Batley and Spen Jo Cox in Birstall West Yorkshire on 16 June 2016, of a killer with sympathies for, if not ties to, the far-right. It was originally alleged that her killer shouted ‘Britain First’ or ‘put Britain First’ as he shot and stabbed Cox, a prominent Remain campaigner and champion of refugees. 52 year old Thomas Mair, who has been charged with the murder, later claimed that he said ‘this is for Britain’ and ‘keep Britain independent’. The original witness statements led the group Britain First to deny responsibility or links, claiming that it was likely used as a slogan, but an image which appears to be of Mair campaigning for the group soon emerged on the internet. Britain First is the far-right party founded in 2011 by Jim Dowson and led by former British National Party member Paul Golding. They are virulently anti-Muslim, anti-immigrant, white nationalist, and engage in street patrols, militant direct action and have representatives who run for elected office, including Golding who recently lost the 2016 London mayoral race to Sadiq Khan, who was subjected to an Islamophobic campaign by Tory opponent Zac Goldsmith. In addition to links to Britain First, Mair is also alleged to have purchased material including instructions on how to make a pistol from the US based neo-Nazi group National Alliance, infamous it is for being led by the late William Pierce who wrote the Turner Diaries which influenced the Oklahoma City bomber Timothy McVeigh. He is also alleged to have ties to the anti-EU Springbok Club, which had supported Apartheid. When asked to state his name in court on 18 June, Mair answered ‘My name is death to traitors, freedom for Britain’. Too often when a case of far-right violence occurs, politicians, the media and public are quick to paint a picture of an individual who has stepped outside the boundaries of reasonable, rational democratic discourse and practice to espouse extremist views and use violence. Often the individual in question is described, as Mair has been by the media, as a mentally unstable loner. Some will claim that this depoliticises the actor and act, particularly if this is the dominant or only framing, but Mair may demonstrate that a psychological and political reading and reality can co-exist. At this stage, he has clear far-right political beliefs and links (even identifying as a ‘political activist’), and both the far-right links and mental illness are lines of police enquiry. Some will claim that this individualisation (based on mental illness or ‘lone wolf’ designation), deracialises the actor and act, allowing white British people to not have to identify with him or it, distance themselves, provide a collective alibi and even apologise as Muslims are frequently asked and pressured to do after a terrorist attack. This is a fair and important point to make after attacks by Anders Breivik, Dylan Roof and other ‘white’ perpetrators. As Mair’s act was committed in the name of Britain and against foreigners, and he had an association with Britain First, the racist double standard and irony are obvious. So too is the irony when Britain First defensively distanced themselves from Mair and the shooting as if they think collective guilt by association with terrorism is a bad thing, but it might just be when it applied to them. Yet, it is becoming clear that the mental illness aspect does not preclude far-right links, and that this case is being investigated by anti-terrorism officers. But that does not necessarily make all white Britons suspect (beyond those such as Britain First who think they are representatives), as the label of ‘terrorist’ which many, such as The Independent’s Yasmin Ahmed, are calling for is rarely enough to break apart racist discourses and structures. Some will claim that even the focus on far-right extremism and terrorism distracts from the mainstream hate, as well as structural and institutional forms of racism and xenophobia that may not only provides the context for and underlies the attack, but also plays a role in the double standards where Muslims are held to account and white Britons are not. What is interesting and important about the response to the Mair case is that many commentators are putting the murder in the context of the increasing polarisation, inflammatory tone and racist fearmongering in the EU Referendum debate – from the Brexit Leave campaign – and holding wider social and political forces, beyond the far-right, to account. According to Polly Toynbee, ‘Brexit supporters have unleashed furies even they can’t control’. Adding that ‘This campaign has stirred up anti-migrant sentiment that used to be confined to outbursts from the far fringes of British politics’. Daniel Trilling argues that ‘Far-right politics cannot be as easily cordoned off from the mainstream as people would like to believe. Fascists attach themselves to popular causes and drag the debate in their direction. Populists and parties of the center take note and then try to appeal to voters susceptible to the far right’s messages by taking xenophobic positions of their own’. The tone of the campaign and far-right, and links between them, can also be seen in the context of the wider normalisation of racism, anti-immigrant xenophobia, Islamophobia and exclusive racialised nationalism, as well as racialised populist anger, in ‘mainstream’ politics, media and public discourse that have been developing since the financial crisis, fed into the referendum and been intensified by it. What we have seen is the mainstreaming of the extreme, informing an emboldening and radicalisation of the mainstream, and further emboldening and radicalisation of the far-right. Britain has now produced a paramilitary American-style far-right and someone, even if only inspired by it, has already taken a life. There are other, more concrete worrying signs. Just prior to the murder, Britain First ran a training camp in Wales, learning about self-defence, martial arts, knife defence, survival techniques and more, and on 17 June, a day after the murder, Britain First issued a threat against Sadiq Khan and ‘all Muslim elected officials’. While in the extreme, it occurs in a context of a debate that has moved so far to the right (in fact, both Leave and Remain are led by the right), that previously unacceptable, dehumanising discourses are the currency. Warnings about the economy if we remain is considered ‘fearmongering’ (with the Remain side designated ‘Project Fear’), and warnings from the Leave side about the threats posed by refugees, immigrants and Muslims, including of attacks in the future, that are dressed up in age old racist language and imagery are seen as honest, true and urgent. The UKIP leader and representative of the Vote Leave and Leave.EU campaign (the former were not sure he was mainstream enough at first, but eventually let him loose as the debate and electorate moved in his direction), claimed that a Cologne style sexual assault by refugees is likely if Turkey joined the EU and Britain stayed in. The Leave campaign also released an ad in the immediate wake of the 12 June 2016 attack on the Pulse in Orlando, just days prior to the murder of Cox, that claimed that an ‘Orlando style atrocity’ could happen in Britain if it stayed in the EU. For a campaign poster, they used an image of thousands of refugees, none of whom are white, crossing from Croatia to Slovenia (not Britain) in 2015 with a banner reading ‘Breaking Point: the EU has failed us all’. This led to accusations of racism, a complaint to the police for incitement to racial hatred and comparisons to Nazi propaganda images. The campaign also targeted the far-right on social media and Farage met with English Defence League (EDL) members. One could ask if Farage, UKIP, Leave.EU and Vote Leave, as well as other Brexit campaigns, wouldn't be embarrassed by the charges of hypocrisy if a British nationalist, such as Mair or others, committed an act of violence or terrorism in the name of Britain, Britishness and Leave? What would they say? While Farage tweeted his condolences like most other politicians, there was no hint of the apology that Muslims are expected to issue for merely belonging to the same religion. Farage appears to consider such groups either a potential support base or representative of the country, as victims of injustice, with righteous anger. Farage did not just instigate and fuel hate and anger, but has justified and even threatened violence. In a May 2016 BBC interview, he said ‘It’s legitimate to say that if people feel they’ve lost control completely, and we have lost control of our borders completely as members of the EU, and if people feel voting doesn’t change anything, then violence is the next step’. It not only harms the targets and damages the social discourse and social relations, it also leaves little space for reconciliation. If we stay, those immigrants, refugees and Muslims scapegoated initially will find themselves on the firing line, as will Remain supporters in the political class and public. If we leave, those thinking that immigrants, refugees, Muslims and the EU are to blame for all the problems, including Tory-led austerity, cuts to public services and unemployment with be sadly disappointed and be looking for a scapegoat they have ready made. According to Chimene Suleyman, ‘Britain has confused social sociopathy for economic debate’. The people scapegoating and looking for someone to blame for problems whether we are in or out are the mainstream political class, media and voting public. This campaign has emboldened racists and made others think racism is the analysis of and solution to their problems. The mainstream does not only instigate and fuel this in civil, or now uncivil society, but this move to the right, and fear and dehumanisation of refugees and others has already cost lives, as it has become acceptable to deny shelter to those fleeing war (which Britain has often played a role in) and other dangers because the voting public has been encouraged to make humanitarianism and open welcoming arms, which Cox represented, an electoral liability. Labour even sold control immigration mugs to raise money in the 2015 election campaign. Yes, once in a while the sea spits out a child and refugees get a moment of reprieve from the hate and rejection, but that soon ends. It isn’t only immigrants and refugees who are dehumanised and rejected though. Tory austerity policies have demonstrated that the poor and vulnerable in general are unworthy and disposable. Yet, we are told that even that is the fault of the EU, immigrants and refugees who cost too much and take from ‘our’ own. This racist divide and rule, where ‘our own’ are racialised as white and everyone else is a threatening outsider, is toxic, corrosive and has become the reality for many. When I arrived in Britain from Canada as a student in 1997, the country and New Labour, seemed to publicly embrace multiculturalism and immigration (although that would be sacrificed near the end, and was something the right blames them for, and cites as a reason for Brexit). I felt welcomed and have watched as the country has become harsher, more exclusive, intolerant and less welcoming. Hatred and scapegoating has not only become acceptable, but serves as a form of political currency for the media and politicians. Polly Toynbee is correct about ‘How recklessly the decades of careful work and anti-racist laws to make those sentiments unacceptable have been overturned’. For her, ‘This is the sound of Britain breaking. Here ends our “moderate, tolerant” self-image’. But it is not all about the ‘self’. It is something that many of your friends, colleagues and possibly family members, as well as those you interact with but do not know, who are immigrants and refugees (or have been), Muslim, European, Black or Asian, are forced to listen to and endure from their elected officials, television and magazine racks in shops, posters in the streets and on public transport, conversations in the streets, around the water cooler at work and in the pub, coffee shop and restaurant. The message is that we are no longer welcome here, our fate is yours to decide, and it matters no more than a power struggle on the right. This island is in serious retreat. Something not seen since Powellism in the 1960s, although now we have small island nationalism with a nostalgia for empire. The danger is already being seen. It is retreating so far inwards (without the benefits of introspection) that it will implode or eat itself, consumed by hate and consuming those deemed a threat or barrier to self-realisation. That is where fascism manifests. For the political elites driving this racist, scapegoating campaign, that is just the cost of doing business.